When New Era Technology of West Chester, Pennsylvania was asked to upgrade the video technology driving a ChristieMicroTiles wall at the University of Pennsylvania’s Perelman School of Medicine, the integrator chose the Christie Spyder X80multiscreen windowing processor. The MicroTiles wall, located on the first floor of the Smilow Center for Translational Research, had previously employed a Christie Spyder X20 processor. 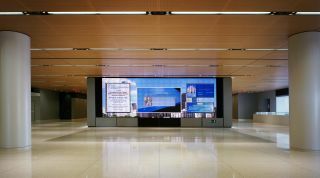 Located in a high visibility area outside an auditorium, the multifunctional wall displays pre-recorded daily content and handles overflow video from events in the auditorium. It also shows content provided by other groups wanting to benefit from the public space. The company adapted existing daily content for the wall and determined protocol on how to support content supplied by special user groups and export video from the auditorium to the wall. New Era Technology Senior Engineer Frank O’Hara worked with the Christie team in the beginning of the project to engineer the upgrade allowing New Era Field Engineers Jeff Daddario and Steve Rogers to collaborate with Programmer Eric Howell from Christie during the commissioning phase of the project. Eric Capozzoli was the Project Manager, Media Technology & Production, Space Planning & Operations at the Perelman School of Medicine.